In this work, a Li-rich layered 0.5Li2MnO3.0.5LiMn1/3Ni1/3Co1/3O2 (LMNCO) pristine cathode material synthesized with a glycine-nitrate combustion method is further coated with silver. 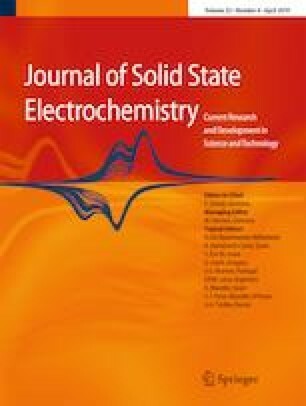 The effects of silver coating on the material structure and performance of the as-prepared cathode are systemically studied with X-ray diffraction (XRD), scanning electron microscope (SEM), galvanostatic charge/discharge, cyclic voltammetry (CV), and electrochemical impedance spectra (EIS). Material characterizations and electrochemical measurements show that the surface modification does not lead to the change of crystal lattice parameter and particle morphology. It is found that the rate capability and cyclability can be significantly improved, which could be attributed to the enhancement of electronic conductivity of the particle surface of the cathode. It has been found that the obtained silver-coated LMNCO cathode exhibits excellent electrochemical characteristics. For example, it can deliver a high initial discharge capacity of 290 mAh g−1 between 2.0 and 4.9 V at a rate of 0.05C at room temperature and a discharge capacity of 159 mAh g−1 at 1 C, 128 mAh g−1at 2 C, and 101 mAh g−1 even at 5 C. EIS result shows that Rsf and Rct values of LMNCO are bigger than those of silver-coated LMNCO cathode.